Allow me to make a bold prediction for 2015. As well as the Year of the Sheep(or Goat), 2015 will also be the Year of the Pot, of the ceramic variety. 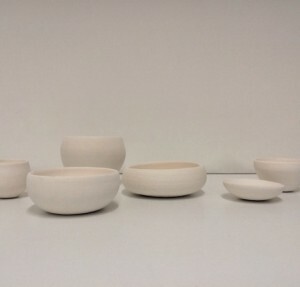 This prediction is not based on a flight of fancy, but on what is happening out there, what is currently on offer and what is planned throughout the year: contemporary ceramics will be the focus. 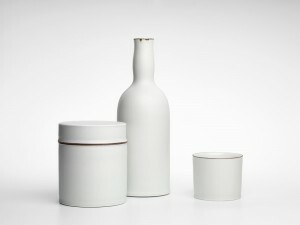 Ceramics are not so much making a significant comeback, rather eyes and minds are once more appreciating this practice. 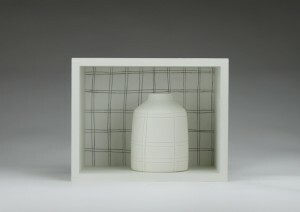 Ceramics were notable for their greater inclusion in the recent Art Basel Miami and Design Miami. Anecdotally, the work exhibited held its own well against digital media, installations and the ephemeral. Some might say, from a trend aspect and from a commercial perspective, this may be a turning point for the growing acceptance of ceramics as a serious collectable art form. I don’t intend to follow any shallow trends or pursue the well -trodden “what’s hot; what’s not” trail of the art world, but I am interested in drawing attention to what is swirling around us, organically and genuinely. In 2015 there is much to see and think about with contemporary ceramics. Clay 2 at Utopia Art in Danks St was what got me thinking. There was a Clay (1) last year, an exhibition showcasing contemporary ceramics as a way to pay homage to the late, great Marea Gazzard (the Estate of which Utopia represents). Clay looks set to become an annual event and given the standard of what is on display now, that would be most welcome. Eloise Rankin, whose work was a standout at the 2014 NAS Post Grad show presents more work from the same series,” I am my mother’s daughter”. It tells a personal story of nostalgic yearnings for home using small scale porcelain pots and bowls placed in hand crafted boxes, against backdrops of fabric swatches from her mother’s quilting samples. 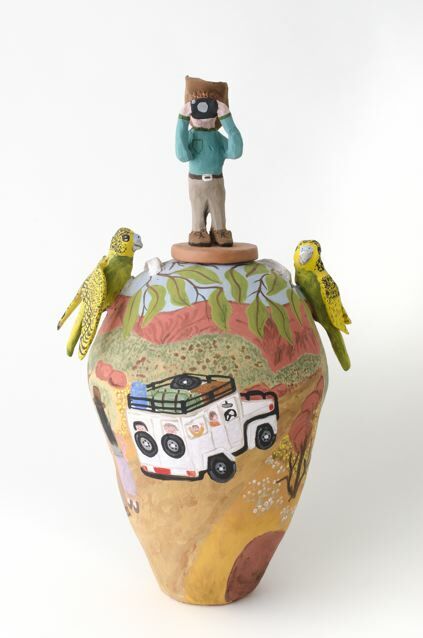 You may have seen the work of Glenn Barkley the ceramicist, as opposed to Glenn Barkley the curator, in Glazed and Confused at Hazelhurst Regional Gallery, which has only just closed. 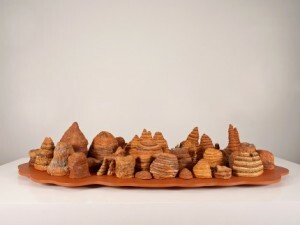 This project began a couple of years ago with Lynda Draper, a teacher at Ceramics Design Studio Sydney TAFE who invited established artists to undertake a residency to experiment with clay while giving them access to the technical knowledge of the Studio staff and students, and specialist equipment and facilities. The resulting cross-pollination of industry knowledge, concepts, media and processes produced an exciting and varied response from the artists which was present in Glazed and Confused. Barkley has thrown himself into the potter’s world and onto the potter’s wheel, and found a practice which he is keen to push and explore. What he produced for Hazelhurst has been taken further for Clay 2. The works are tremendous: seemingly roughened, yet incredibly detailed with painstaking additions and extraneous ‘bits’. With loopy handles which serve no purpose and stuck-on bits which droop and flop, overall punctured with tiny holes, the works feel like a loosely knitted or crocheted object, which would collapse on touch. 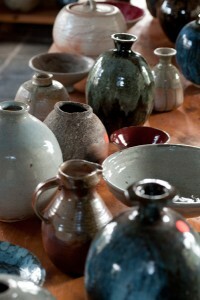 Yet, fired up and cured, they are pots and jugs and vases to be held, used and cherished. One thing about making pots is the physical effort required: pushing, rolling and kneading tough clay, to make it malleable and workable, and taking command of the wheel, requires strength and determination. Donna Greens’ works illustrate this physicality. These are not modest pots, but large scale, seemingly free form and random organic vessels. They are shaped, then poked and pummelled by Thomas’ fingers, hands, elbows to push the shape into something else. She calls it her “gestural freedom”. 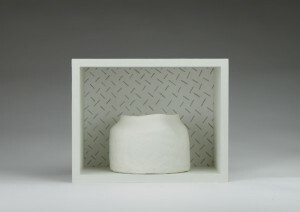 Her glazing process is equally considered and the results are wonderfully complex and nuanced. Her work does enshrine that understanding that, for potters, all must be technically spot on, otherwise it fails in the firing. Unfortunately the show will have finished by the time of the major Art Month 2015 experience, The Art of Eating: Ceramics, Food & Conversation. This dinner, held in Utopia Art, is focussed on using ceramics and not just looking at them, because “the joy of beautiful objects is only truly felt through use.” Liane Rossler and Brett Stone have been commissioned to create the ceramic tableware for the evening – you get to eat off them and then take one piece of each home. 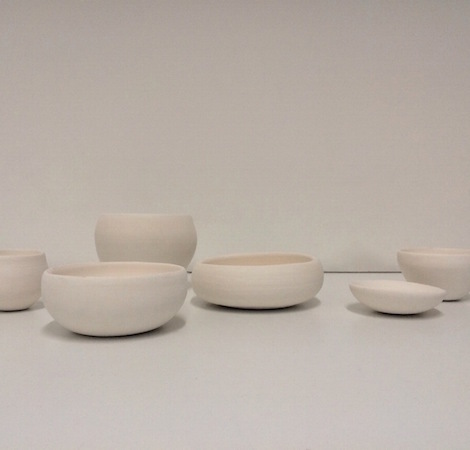 Also for Art Month, Liane Rossler is holding a solo exhibition (at Annette Larkin Fine Art) called Shelfie: ceramic bowls on shelves. Simple, genuine and beautiful. More ceramics in Danks St at the moment. 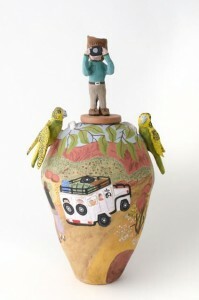 A couple of works from the Hermannsburg Potters, known for their delightful painted vessels with the figurine stoppers. Annette Larkin Fine Art has a couple from the Gary Sands Collection. 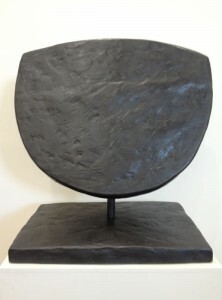 Peter Pinson, now art dealer, no longer gallerist (another one closed – disappointing) also has several available. Rona Rubuntja Tourists at Hermannsburg 2010. ht 50cm. Image courtesy the artist and Peter Pinson Art Dealer. Angela Brennan has just had a show at Roslyn Oxley9 Gallery of Rustic Deities, painterly ceramics – which are a natural extension of her luscious approach to painting. Angela Brennan Rustic Deities 2014 installation view. 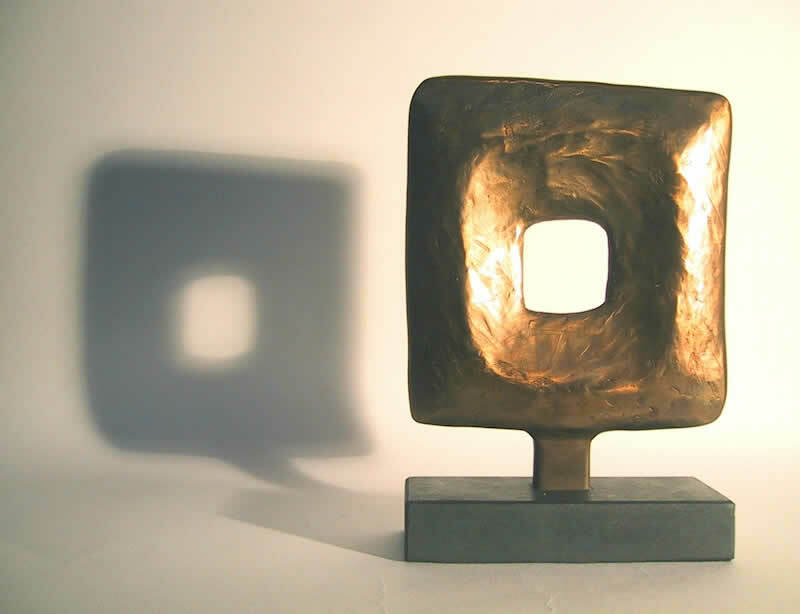 Image courtesy the artist and Roslyn Oxly9 Gallery. Tim Olsen is posting fab images on FB of new saucy plates by Stephen Bird at OlsenIrwin and Gareth Sansom (whose latest shows opens at Roslyn Oxley9 Gallery next week) is loving them! OlsenIrwin, through Rex Irwin, represents some of Australia’s leading ceramicists: Gwyn Hansen-Piggot, Prue Venables and Sandy Lockwood, who is exhibiting work in April 2015. Rex has never shied away from the aesthetic authority of the humble pot. Ross Longmuir from Planet Furniture has built his successful, enduring business on his respect for the crafted object, be it ceramics, textiles or furniture design. As with all the pieces and artists he works with, Longmuir has always pursued fine crafting, natural elements, integrity, sustainability and style. Since 1991, many a ceramicist has launched a successful career through his representation. 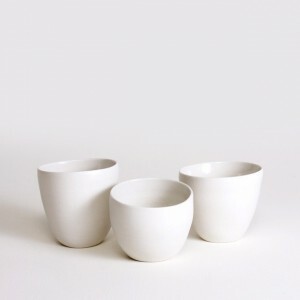 Szilvia Gyorgy handthrown mug off centre. porcelain. Image courtesy the artist and Planet Furniture. The Australian Ceramic Triennale is being held in July in Canberra. This is the 14th The event attracts leading national and international industry leaders, ceramics practitioners, educators, collectors, critics and cultural theorists to a full conference program which includes key note speakers, individual artist’s presentations, master classes, exhibitions, a trade fair and a potters’ market. 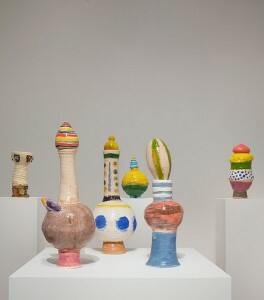 And to coincide with this international event and to mark a major milestone of having notched up 50 years of teaching ceramics, the National Art School in Sydney is hosting a major exhibition, New Disciples: 50 year of ceramic It is guest-curated by curator and ceramicist Glenn Barkley and aims to explore the importance of ceramics as an art form in Australian contemporary culture. 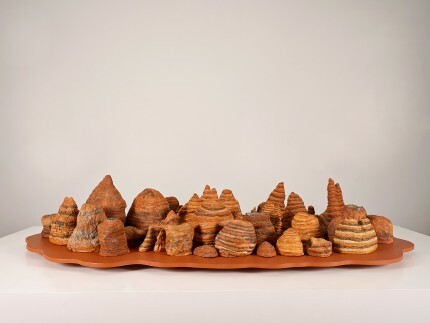 Central to this exhibition will be the opportunity to articulate and acknowledge the significant contributions Peter Rushforth has made to Australian ceramic practices over generations, as a teacher and mentor at NAS. There must be something in a life devoted to earthly elements, as Rushforth continues on, well into his 90s. There will be 5 recipients of a portion of the Award, who will each receive a stipend to produce a body of work for the major Award exhibition. One of these recipients will be awarded the jackpot of $50,000 and their work will be acquired into the SAM Collection. That is happening in August – keep an eye out. Kirsten Coelho was the 2012 Award winner and speaks openly of the opportunity such an award has given her, particularly recognition of the professionalism of her practice. 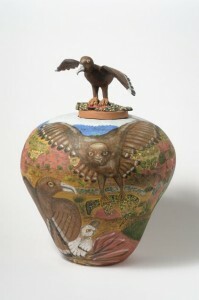 SAM also hosts the National Indigenous Ceramics Art Awards. The argument that prevailed in the ’70s about form over function, and craft being relegated to a lesser platform than the so-called ‘finer arts’ is just no longer relevant. What I believe is more relevant, is the increasing need in our digital, virtual, easily replicable world, for the unique hand-made item which retains a strong connection to the natural world; an item which allows us to pause and consider moment of beauty in daily life. Ceramics do that and 2015 offers the opportunities to celebrate this.